How to Fly the B-25 DVD video covers the B-25 Mitchell bomber of World War II. 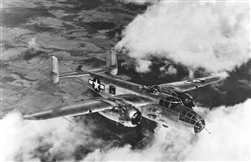 Included are three B-25 films and the B-25 pilot's manual on the DVD. Film #1 - How to Fly the North American B-25 Mitchell. The Navy Department produced this B25 pilot training film for use by all services. Named after Billy Mitchell, the controversial pioneer of heavy bombing, this is the plane that Jimmy Doolittle chose to fly off the deck of carrier Hornet for the dramatic raid on Tokyo. Extremely versatile, the '25 was the US's most produced medium bomber, fighting in all theaters and exported to virtually all Allied air forces. An effective level bomber, it could also be equipped with a multitude of additional machine guns, rockets, and even a 75mm canon, for low level ground attack. In B+W with a run time of about 22 minutes. Film #2 - Air Operations Lae-Salamaua. This film covers a key battle of the oft overlooked 1943 New Guinea campaign in the South Pacific. General Douglas MacArthur and his staff put together a brilliant combined arms strategy that utilized Air Power as a key element to leap frog over rugged jungle terrain and isolate and destroy Japanese strongholds. While tough Aussie jungle fighters spearheaded the frontal ground assault, American paratroopers accompanied by Aussie light artillery volunteers dropped on, seized & secured a Japanese air base behind enemy lines so that an Aussie division could be ferried in on C-47s and attack the enemy from the rear. This film effectively uses maps & illustrations to show the strategy and tactics used in this classic battle. In the almost impassable terrain, that made transport of heavy guns slow and difficult, air power functioned as 'flying artillery'. You'll see spectacular in cockpit views of B25 Mitchell medium bombers making strafing runs on Japanese bases at tree top level as well as some of the first ever 'on the deck' tail gunner views of delayed action and 'para frag' bombs dropping & exploding right behind the hedge hopping Mitchells. Some nice A-20, B-24 & P-38 action footage too! In B+W with a run time of about 31minutes. Film #3 - Winged Artillery. This film shows nine 75mm cannon firing B-25Gs of the 48th Bomb Squadron, 7AAF, based on Apamama in the Gilbert Islands, conduct a hair raising tree top level strike on the Japanese air base on Mille. Also features amazingly well preserved and very rare color footage of daily life of air crew and ground personnel stationed on Apamma and Tarawa. As a bonus, you'll watch Sea Bees using heavy equipment to transform these hard won tropical atolls into fully functioning air bases and ground crews maintaining the Mitchell's massive cannons. In color with a run time of about 25 minutes. A 94-page B-25 pilot's manual is included on the DVD. It is in .pdf file format with detailed photos, systems diagrams, performance charts, procedures & more. The manual can be accessed on a computer equipped with a DVD drive.